ADALBERT (VOITECH), a Bohemian (present-day Czech Republic) noble who was converted and educated by St. Adalbert of Magdeburg (20th June), whose name he later took. Consecrated Bishop of Prague (present-day Czech Republic) in 982, St. Adalbert was forced to flee his See a few years later due to opposition from the local nobles. He went to Rome where he stayed at the Abbey of St. Boniface, and whilst there received monastic tonsure. St. Adalbert was sent back to his See by the Pope John XV (r. 985–996), and once again he was forced to flee. He appealed to Pope John and was given a blessing to evangelise in Pomerania, Poland, Prussia, Hungary, and Russia, which proved to be fruitless. 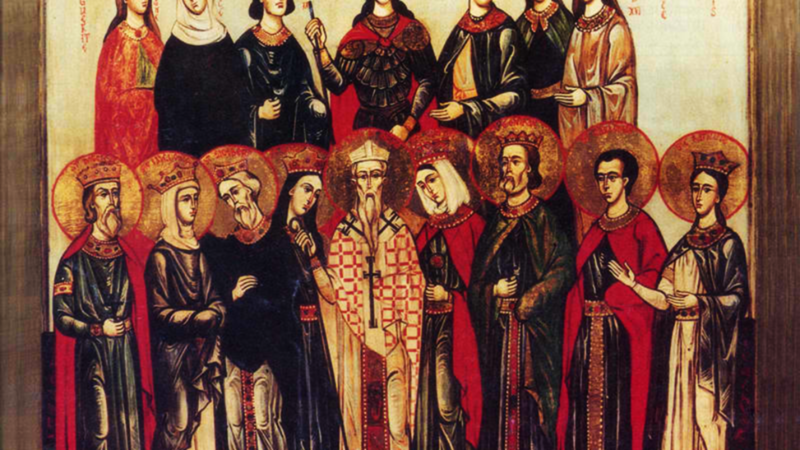 St. Adalbert along with his missionaries were martyred near Danzig (present-day Gdansk, Poland) in 997. FELIX, FORTUNATUS, and ACHILLEUS, a priest, and two deacons sent by St. Irenaeus of Lyons (28th June) to enlighten the area around Vienne (south-eastern France). There they were arrested and subjected to numerous horrific tortures, and finally martyred in 212. GERARD of TOUL, a native of Cologne in present-day North Rhine-Westphalia, Germany and member of the nobility who after witnessing his mother struck dead by lightning dedicated his life to prayer and penance. St. Gerard was consecrated Bishop of Toul (north-eastern France) in 963. As bishop, he defended his diocese from secular interference, rebuilt the Cathedral (though the current Cathedral dates from 1447), and established monasteries with schools attached staffed by Greek and Irish monks. St. Gerard reposed in 994. IBAR (IBERIUS, IVOR), (Fifth Century), one of the missionaries (along with SS. Cearan (14th June), Ailbe (12th September), and Déclán (24th July) who are considered by many to have preceded St. Patrick (17th March) in the conversion of Ireland, though others believe that St. Patrick (17th March) ordained him. St. Ibar strived to spread the Gospel in Leinster and Meath, and built a monastery at Begerin, Co. Wexford, Ireland, which attracted many monks, including his nephew St. Abban (16th March). In his Litany, St. Ængus (11th March) invokes the “Three thousand confessors” who assembled themselves under St. Ibar’s rule. He is believed to have reposed circa 500, and his relics were enshrined at the monastery at Bergerin. MAROLUS, of Syrian birth, St. Marolus moved to Rome in early adulthood. There he became good friends with Pope St. Innocent I (28th July), and in 408 was consecrated Bishop of Milan. St. Marolus served his See until his repose in 423. PUSINNA, (Fifth Century), a maiden who spent many years living as a hermitess in her parent’s house in Binson, present-day Binson-et-Orquigny, Marne in northeastern France, where she and her six sisters formed a religious community.